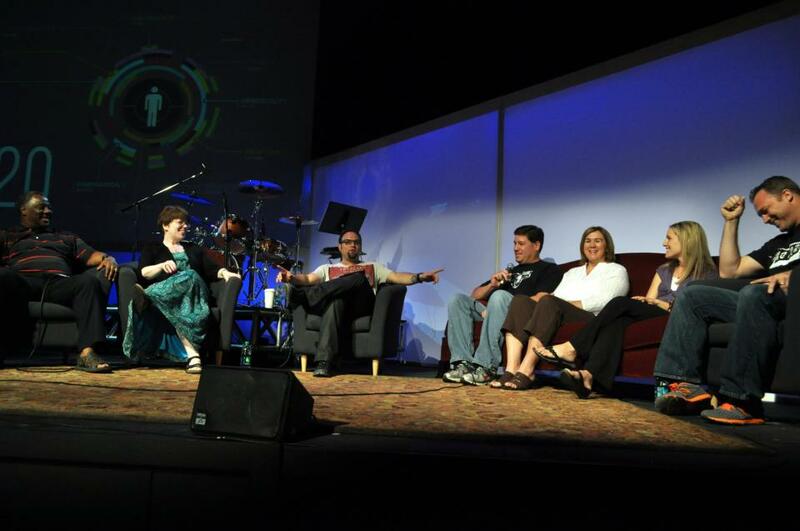 We just completed an awesome series at our church called You 2.0. It was a series about redefining success and resurrecting your dreams. It was about choosing significance over safety, contribution over comfort, and embracing the path of uncertainty, mystery, and risk. It was about saying: Enough of ordinary. Average is overrated. Your life matters. I have been learning to try to live this way over the last few years. I am continually understanding that there are things I can be doing to live a better story. I don’t have to live a numb, dull life. You can read how I started on this journey here. 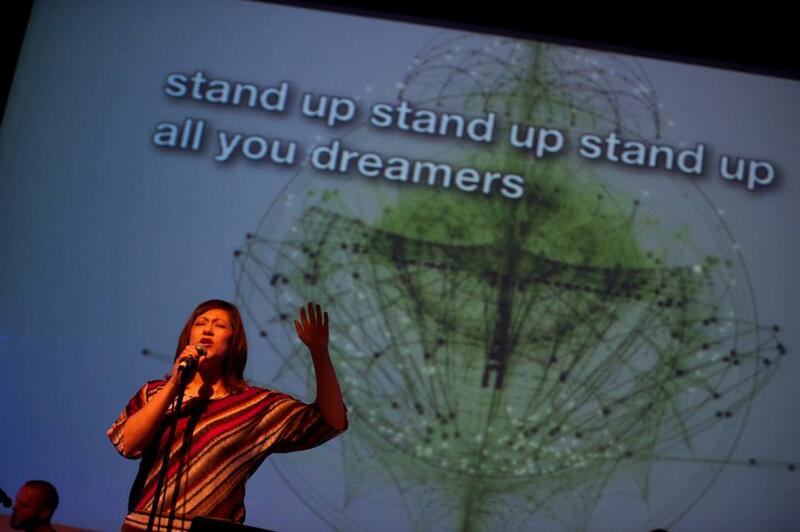 I was extremely honored when my Pastor invited Rick and I to be a part of a group of people to share their stories during church last weekend. I talked about my blog, how your voice matters, and how I am learning to make a difference right where I am. Rick talked about starting mountain bike racing at the age of 43, and how he has taken significant steps forward in his faith over the last year. You can read more about his journey here. I have to tell you that it was pretty awesome. If you would have told me a year or two ago that Rick would be willing to get up in front of our entire church, for three services, and share his story, I would have said you were crazy! I am so proud of him. I love Scott’s expression. I wish I knew what Rick had said during this picture! 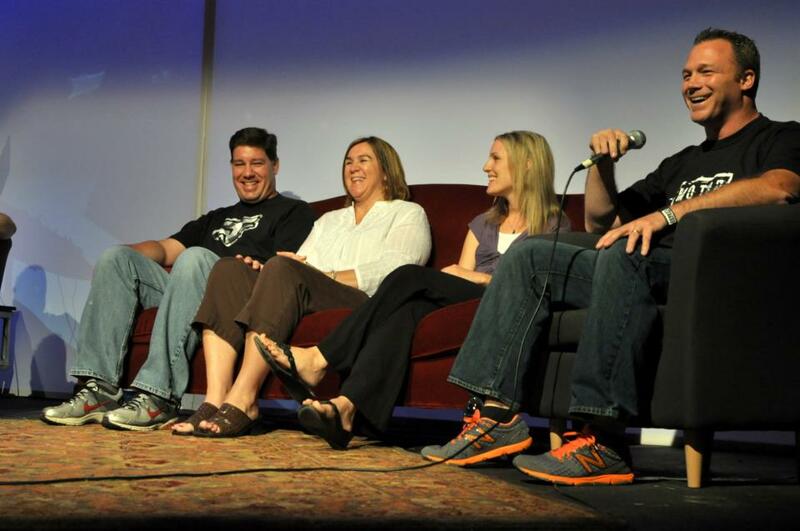 We were honored to also share the stage with our friends, Toney and Laura Burton, Joy Thomas, and Tom Reber. They have amazing stories and each one of them inspires me. We heard so many great comments from people who were inspired by our stories. It is always nice to be able to help people see normal, real people who are taking steps forward. We certainly don’t have it all figured out, but we are all trying to live You 2.0. A friend summarized our messages with this great status update on Facebook. No more waiting for “what if” moments… Time to let go of the brakes, accept who I’ve been created to be, believe my voice matters, take risks and live MOTOR! We had a great weekend, and I felt good about being able to share our story. We had some great laughs! So imagine my surprise on Tuesday, when I had one of the worst days I’ve had in a long time. I am naturally pretty laid back and really don’t get worked up too often. But Tuesday was just one of those days. It stunk! I was extremely irritated and frustrated at work, and the day just continued on that same path. I don’t have days like this often, so it always catches me off guard. I started doubting all of the things that I had just talked about over the weekend. The voices in my head were loud. And they weren’t nice. They were saying: maybe I can’t really make a difference. What good can I do? Who am I to try to do this? Why can’t I figure out what my big dream is? Maybe I am not cut out for this. So, I am continuing to learn that living a unique life requires you to think differently. It requires you to constantly check where your attitude is. It requires you to understand that some days are going to be rough. It requires you to give yourself some slack. And to surround yourself with people who can help encourage you to keep living a better life. Are you working on a dream? How do you silence those doubting voices? Michael Hyatt is an inspiration. If you’re not familiar with him, he writes about intentional leadership on his blog, which has hundreds of thousands of followers. He knows what it takes to share his message, and build a tribe of followers. That’s why I was excited to read his new book, Platform: Get Noticed in a Noisy World. If there is anyone who can effectively teach us about getting our message heard, it is Michael Hyatt. He has done it well, and is graciously offering his insight in his new book. The great thing about this book is that it is not just for writers or bloggers. Artists, musicians, creatives, business owners, and anyone with a message to share, can gain critical, behind the scenes advice. Similar books may give you the motivation and inspiration to try something new. However, they rarely give you the practical steps and every possible resource to make it happen. If you’re like me, you may have mixed feelings about the word platform. It has been used poorly by some people, and it can also seem somewhat self-centered. Michael had some great advice to help us understand the benefits. 1. A platform provides visibility – it makes it possible for everyone in the audience to see you. 2. A platform provides amplification – It enables you to be heard above the roar of the crowd. 3. A platform provides connection – Social media now creates engagement and intimacy that has never been possible before. When I read this book, I felt like I was given an insider view to Michael’s success. He seemed like a friend sitting down and giving me every incredible resource to help me move forward. In fact, there is so much information in the book that you will most likely keep this as a reference manual to refer back to again and again. I am reading through the book for the second time, and I will continue to come back to it after I have completed the previous steps. Not only is Michael sharing his incredible insights, but for THIS WEEK ONLY, he is also giving you over $375.98 in bonus gifts! Who can say no to that? The book itself is worth ten times its price. This is an incredible deal. Make sure that you purchase the book before midnight on May 25th in order to get the bonus gifts. I promise it will be worth it! 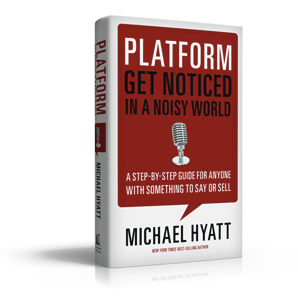 This week, I was chosen to be on a team of people who will help Michael Hyatt launch his new book, Platform: Get Noticed in a Noisy World. I was shocked and honored, to say the least! 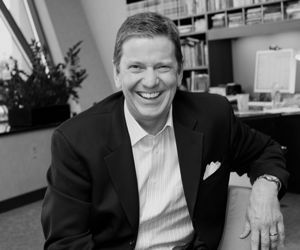 If you are not familiar with Michael Hyatt, he writes about intentional leadership, productivity, publishing, and social media. He is the Chairman of Thomas Nelson Publishing, and held the title of CEO until last year, when he chose to step down to pursue his writing and speaking full-time. Michael has over 400,000 monthly readers on his blog, and over 900 people applied to be a part of this launch team. 100 were selected. As a part of this team, we received an early copy of the book, and have been sharing our notes and reviews. It has been an amazing experience so far. 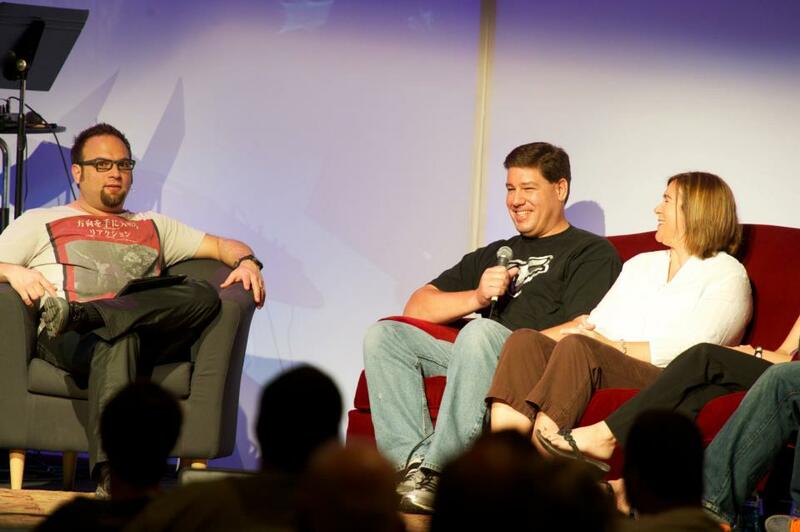 In addition to extremely experienced bloggers and authors on the team, Michael and his wife, Gail, have also been active in the conversations. It has been really neat to interact with everyone and share our conclusions and helpful to-do lists from the book. This book is overflowing with expert ideas to build a platform, and it is truly a unique experience to hear from the author directly. The book can be applied to your business, personal, or professional life. I will be using it as a reference guide, and I highly recommend it. If I can implement even a small portion of what is recommended, I know that it will have a huge impact. Platform will be released the week of May 21st. But don’t buy it yet! Michael will be offering an amazing set of bonus gifts when you purchase the book during the release week. Until then, you can sign up to receive important book updates at www.michaelhyatt.com/platform. I will blogging more about this next week, so stay tuned! Have you ever been a part of a launch team? If so, what did you learn?